AHHHH SUMMER!!! The time of year that I find it’s hardest to get myself into the shop to work on projects, but yet I can’t fight the need to be in there. So to help ease my burden of guilt I like to do smaller projects that are easily accomplished at night or for a few hours on a weekend. Today’s project is exactly the kind of “small project” I’m talking about. Plus another great thing about it is the fact I’m using up some of my smaller stock and scraps that ordinarily become firestarter for our summer bonfires in the backyard. And unlike the standard cardboard six-pack, the handle is much friendlier on the fingers and you could easily adjust it so it rises up further from the bottles for EVEN more comfort. Today’s episode is the first of two parts. We’ll cover a little bit of the milling and dimensioning of the stock along with much of the straight forward joinery I used to make assembly easy and strong. 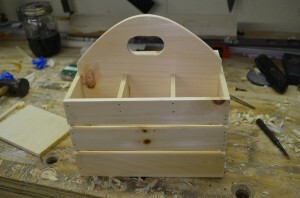 Huge thanks to Bruce at 3D Woodworking Plans for providing a Sketchup Plan based on this project! to download it. …or why not make an 8 pack? 33 1/3 % better! up next…Growler sized carriers for even MORE of a good time LOL! these are much nicer than the ones i just made. i too have been thinking about making some for growlers. 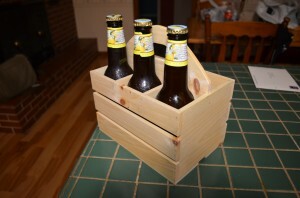 i just made some of these this spring for my groomsmen as gifts for our wedding. they were far from perfect, but they do the job and they were a hit. however, i made removable dividers (i am glad i did), because i apparently designed them to only fit tall skinny bottles. there were a lot of expletives said when i tried to fit some shorter, fatter bottles in them! I had a few choice words when I had everything assembled and discovered something…I’ll share that something in the next video LOL!